For remover I use pure Acetone. It's strong and it removes the polish fast. For clean up I pour acetone in a little glass cup and use an elf make up brush to easily remove any polish off my skin or cuticles. I have a pump acetone bottle, so I just put a cotton ball or felt on top, press down and viola! Instant soakage. When I start a manicure I use Sally Hansen Instant Cuticle remover. This stuff works wonders for removing excess skin from your nails which can prevent polish from adhering and giving a lasting manicure. As an added bonus, it also removes staining on your cuticles. The directions say not to use more than 3 times a week and not to leave it on your skin for more than a minute. It's that good. I use a metal cuticle pusher to push back my cuticles. I use a nail brush with soap, and gently brush away the excess cuticle and/or dead skin. I use the a Nail Tek glass file for shaping. When I want to take off length I use the black Tropical Shine board from Sally Beauty Supply on the fine side. 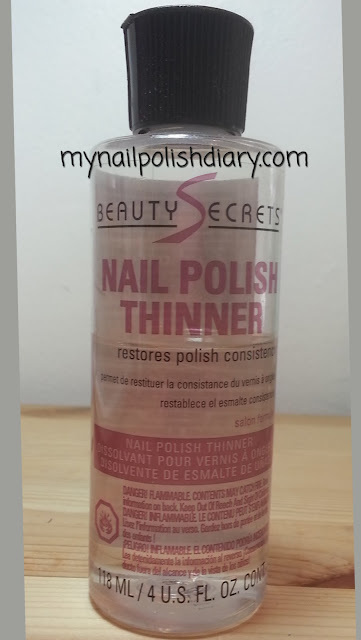 I use the pink Tropical Shine file or yellow block from Sally to smooth the edges and seal my nails after taking down length. My base coat is China Glaze Strong Adhesion. It doesn't stain the nail at all since it's clear. It helps the polish stick to the nail without damage. It makes my manicure last for days. In the few times I've worn polish for a long time, I've had it last over a week, though I almost never wear a color that long. Treatments: I use Bliss Kiss cuticle oil every day at least four times a day. Since I've been using it my nails are strong without being brittle. I don't get hangnail or peelies anymore. I love this stuff! I also use Bliss Kiss ridge filler on top of China Glaze Strong Adhesion before adding my polish. Top Coat: I use OPI Top Coat after my nail color then HK Girl Glisten & Glow quick dry top coat for the shiniest fastest dry I've ever had. It doesn't thicken up and there's no shrinkage like I've had with other QDTC. When I wear glitter polish that is super glittery (thirsty) or stays bumpy after OPI Top Coat I use Gelous before Seche Vite. It almost always smooths out with one coat, but I've had to use two on some extra glittery glitter. Cuticle oil is your friend. I use cuticle oil several times a day on most day. Sometimes I am busy and only get to use it once but I ALWAYS use it at least once a day. I also always use it after every polish removal, then once my polish is dry. Just brush it around your cuticles and under your free edge (the part that grows out past your finger tip) and massage it in. My method is to brush on the oil then use hand lotion and just rub it with the lotion all together. Lotions and hand cremes. I have a lot. They're all over the house. I have the Sally Hansen Firming Hand Creme in the kitchen for when I'm doing dishes. I cover my hands with it then wear a pair of simple cotton gloves under rubber gloves. It protects your manicure, moisturizes your skin/cuticles and you won't burn your hands when you use hot water :) It's like a little sauna for your hands. OPI Avojuice in Vanilla Snowflake...I have four or five of these, one on my nightstand and one on my end table in the den where we watch tv, and a small one in my purse...I love this scent ;) CND iclementine and mistletoe and Bodycology in Vanilla Snowflake (gift from my nieces Lexie and Baylee) are also on the end table in the den. OPI Avojuice in Cran & Berry is also on my nightstand. I have some others here n there in the house. I have more than I need but I have it every place I might have a chance to use it. Use your lotion friends. It's good for your skin and nails! This is the thinner I use when my polish is too thick. It's from Sally's and is great. I never use acetone or nail polish remover to thin my polish. I just add a couple drops of thinner and shake it up. If it's still too thick I'll add another couple drops and repeat until it's as thin as I like it. I've seen this make dried up nasty looking polish look like new.